Winter – the perfect time to get together and play some board games! I’m all about being outside and playing in the snow. But when all that is done what a better way to spend the evening than getting all cozy inside and playing winter board games. These ideas would be great too when the school is closed for a snow day. Or if you are otherwise looking for indoor activities for your kids. I searched for some fun board game ideas for kids and found some very cool ones! This post contains affiliate links. If you choose to purchase through these links, I’ll get a small commission at no extra cost to you. Thank you. A fun family-friendly game. Try to get as much fish as you can before the ice melts away… and it is going fast! To have the most fish you need to also prevent the other players from getting fish. 2-4 players. Another cute penguin themed board game. In this one the players take turns chopping off ice while trying to keep the penguin from falling off the ice. Break off the ice pieces but don’t let Anna or Olaf fall! So much fun for the little ones! Get your expedition team ready and go on an adventure. Race the other players to the North Pole in this fun game for ages 7 and up. The harsh arctic conditions change frequently making your trip to the North Pole quite challenging. 2-4 players. Another cool game set in the Arctic. Sledders pulled by huskies try to get to the finish… but not everyone makes it there. Will you be one of the ones to lose control of your sled or will you be able finish the race? This game is for 2-5 players ages 10 and up. Go on an adventure through the Nordic countries: Finland, Sweden, Norway and Denmark. Collect railway routes while you explore the beautiful Northern Europe. A family-friendly game for 2-3 players. 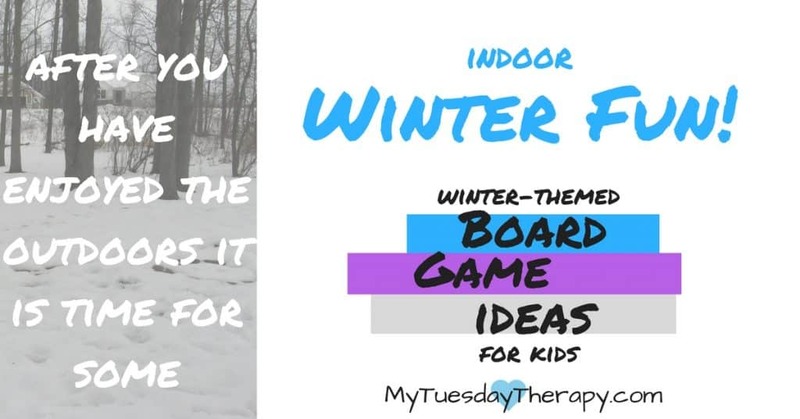 I hope you enjoy these winter board games and have hours of fun with your family! If you need more ideas for indoor fun check out the 68 Rainy Day Activities!